Participated on four of Roald Amundsen's polar expeditions, made sails, tents and trail provisions for polar expeditions, including the tent Amundsen left at the South Pole in December 1911, found a month later by Robert F. Scott and shown in all the famous historic photos. Made many polar trips; led expeditions, including his own expedition, one of only three private American expeditions to the Antarctic in the exploring age (the other two were led by wealthy men). Member of Board of Directors of The Explorers Club; awarded their Gold Explorers Medal. Professional writer and lecturer. 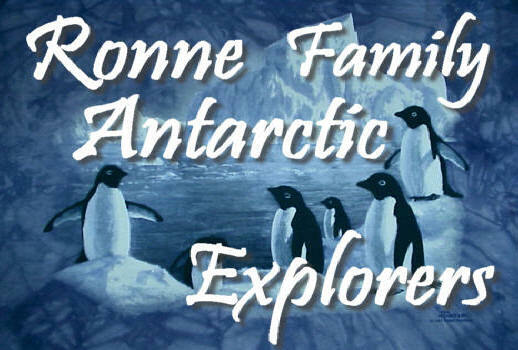 The first American woman to set foot on Antarctica, first woman to winter over, first working expedition member and part of first couple at South Pole; Ronne Ice Shelf is named for her. President of the Society of Woman Geographers ('78 - '81), fellow of The Explorers Club and member of the Antarctican Society. Professional writer and lecturer. Member of the Explorers Club, Society of Women Geographers, and the Antarctican Society. Architect, writer, website designer, lecturer. The Oleona Base Philatelic Covers - "The Holy Grail of Polar Covers"
web site without written permission from www.penguins51.com is strictly prohibited.